One who loves or is so fond of technology that they may overlook the difficulties involved with the machine age such as: externalities, or alienation and misplaced sentiment. An advocate of technical solutions to problems of social, moral or economic origins. Anyone who so cherishes the concept of progress that they believe in the inevitability of constant improvement due to the application of technology to social difficulties. A technophile is anyone who worships material progress, they may be unaware of particularly the three facets of tools, but they do appreciate a culture of technology. Denis Diderot and the democratization of practical knowledge. The Encyclopédie 1751-1772. Technology is more than tools and techniques. A systematic application of knowledge to expressive, manufacturing, mechanical, industrial, or chemical arts with actual effects on people and their surroundings. Applied use of knowledge to enhance and accumulate efficient changes in the human use of tools. Tools may be devices, instruments, utensils, or artifacts used in the creation of material culture to assure survival by solving problems. To put together. Technology also refers to the related series of steps, processes, procedures, tools, and artifacts used to make a product that has a use, finds a market, or meets some need of, or demand from a population. The Alaska pipeline for oil transshipment. Technique refers to a related means or set of ways that are used to effective employ tools so that they work and have the desired outcome when used appropriately. Referred to as procedures, and appropriate procedures are called a protocol. The study of technology is far more than the mere surface descriptions of what a tool is and how it is used for or what it exactly does. There are three distinct facets or aspects of technology which must be understood to actually see how tools shape, intercede in, and eventually envelop our lives, our imaginations, and our relations with others. Tools are devices for making artifacts. When arranged together by techniques into a technically supportive role these devices, implements, or equipment act over time to speed up, reorganize, or accelerate our power to alter conditions. Technology then has a catalytic impact on any society that relies on tools, fuel and resources that technology makes available to economic exploitation. Technologyor the materials from which the dominant tools of a period were craftedhas influenced the names and character of past eras. Andikithera device, c. 300 BCE, Astral Computer from Ancient Greece, Aegean Sea. This instrument –is a trigger to development of sophisticated gears– was found beneath the shallow seas of the island of Andikithera in the Aegean Sea. The device photographed here was actually a mechanically operated calendar keeping, or calendrical device used by priests in Greek temples to predict the solstices, equinoxes and eclipses. Embedded beneath the calcium buildup was a gear discovered with the aid of x-rays that was a 1000 years ahead of its time. The gearing allowed those who used the mechanism --as early as the 3rd century before Christ-- to predict the occurrence of celestial events, such as the first day of spring. Specialists used the device to track the lunar and solar cycles with great precision. Inside this machinery was discovered a specialized part known to us as the invention of the differential gear. This is a gear which can turn at two different speeds, hence the name: differential gear, which is an important technical piece of machinery with numerous applications. This type of gear is capable of turning at two different speeds while connected to the same axle, or drive shaft. As the drive shaft or main axle rotates at one speed the differential gear is able to rotate either more rapidly or less rapidly than the main animating axle. Today the differential gear is the foundation of machinery that drives the industrial foundations of many automated systems we use today. As an essential technological ingredient in modern life, the differential gear is a keystone application in modern transportation. Do you know where differential gears are currently most used in our society? Similarly, the differential gear was reformulated from clocks to radically alter the productive capacity of the textile industry. The differential gear in undergoing one transition to another as it is applied in different inventions to meet different needs has played a signal role in the development of modern technology. What invention with the application of the differential gear reshaped the 18th century? For the answer, see this page! • First week: stories about tools and technology. How tools do what? • Second week: defining what technology is doing to us all. • Third week: Despotic demands of hydraulic technology and fear. 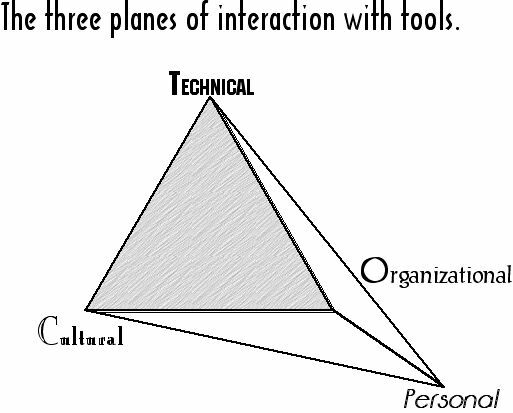 • Fourth week: How people use tools as systemic technical implements. • Fifth week: What allows tools to do what they do? • Sixth week: The synergy of mechanisms that converged as automation. • Seventh to tenth week debates: C. P. Snow's Two Cultures & your choices. • Eleventh week: New industrialism and the power of emergent properties. • Twelfth week: Three revolutions driving the present QED transformation. Last Updated on September 5, 2005, 5-25-2010, and 6-1-2011.